Different parts of the electrics are installed throughout the build, this section should cover the general stuff such as the loom, how to make connections, fixing wiring, SVA requirements etc. This will probably need to be split down into further sections? The manual supplied with your sumo, although not faultless, is one of the best around for the cobra replicas in the UK, one of the most useful pages you will get is the wiring diagram page. The diagram is cleverly laid out in pretty much the way the wiring will sit in the car, this makes understanding it very easy. Here is a rather well thumbed copy of the sumo wiring diagram. If you don't want to keep the side repeaters after SVA one trick is to put them in such a position that they can be removed and the holes covered over with a suitable badge after SVA. It is however advised to retain the side repeaters after SVA as they are a useful safety feature when indicating to turn or using the hazards. There are various options for the speedo sensor, some work with magnets attached to the prop shaft bolts, the most common for Sumos is the daisy wheel type as supplied by ETB. The sensor works by attaching a daisy wheel between the prop shaft and the differential. As the prop shaft spins, the daisy wheel which can have either fins (Pilgrim supplied) or a series of holes (ETB supplied) pass a sensor with a magnet inside it, as the fins or holes pass the sensor, the magnet generates electrical pulses which are picked up by the gauge. An ETB daisy wheel is shown in place in a photo below. The wiring is very simple, just 2 wires from the Pilgrim loom (blue and yellow) which are attached to the sensor (either way round). To attach the sensor to the car is relatively simple. Two common options are detailed below. One option is to make a bracket in the shape as shown. It's best to make this from thin (1-2mm) steel and paint, or better still some stainless sheet. (the bending could be replaced with welding if you prefer) The dotted lines show where to bend the bracket. The 2 holes on the bent back sections are fitted to the bottom of the diff and go between the diff itself and the Pilgrim supplied carrier bracket. Although it appears a lot easier to fix the sensor to the horizontal chassis bar running below the diff, don't be tempted to do this as the diff moves under accelerating and will cause the daisy wheel to hit the sensor, trust me, this is bad. Here is a one side bracket. 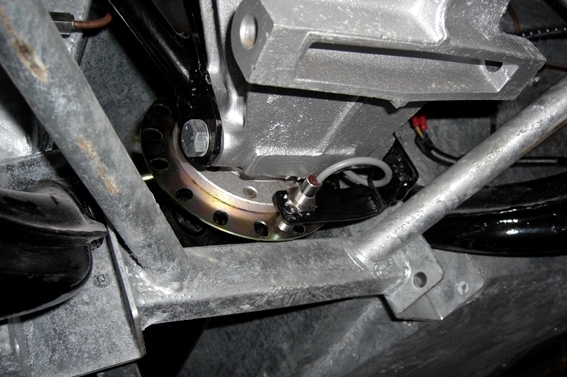 Here it is in place, this one is conveniently fitted below the diff and has 2 nuts for easy adjustment of the gap. The bracket can be fitted above or below the prop, below is easier to get to but is more likely to get hit be stones from the road, above keeps it safe but makes adjusting the gap a lot harder. The adjustment of the gap between the sensor and the daisy wheel should be set as per the ETB instructions, (3mm gap). 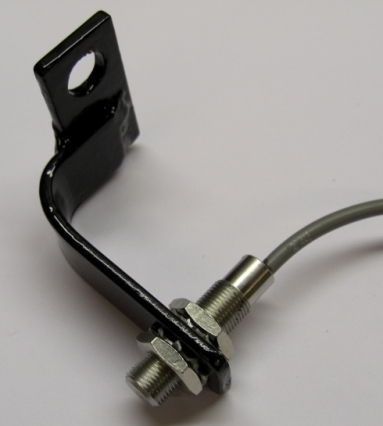 The gap can be adjusted either with washers between the sensor and the bracket or by adjusting the angle of the bracket. A good way to set the gap is to get a 3mm thick piece of ali plate or wood and put it between the two parts while tightening and then remove it. Calibrating the speedo will ideally be done before SVA as the accuracy of the gauge will be tested on a rolling road at the test centre to 70mph. The instructions supplied with the gauge are pretty easy to follow. An easy way to calibrate it is to use a satnav and compare the actual speed with the gauge speed, then pull over and adjust as necessary. If you are not planning to drive the car before the SVA it is possible to calculate the calibration value to enter into the gauge using diff ratio, wheel size etc, or if you're lucky and ask nicely the SVA inspector will let you calibrate it as he tests it, but you do need to ensure the gauge is working before turning up, i.e wired correctly and the gap set accurately. This can be done by running the car with the back wheels of the ground, but this should be done very carefully indeed with proper axle stands in a well ventilated area. Its important to make sure all wiring is properly secured and protected, this will stop it chaffing and shorting out and also let you get through the IVA. 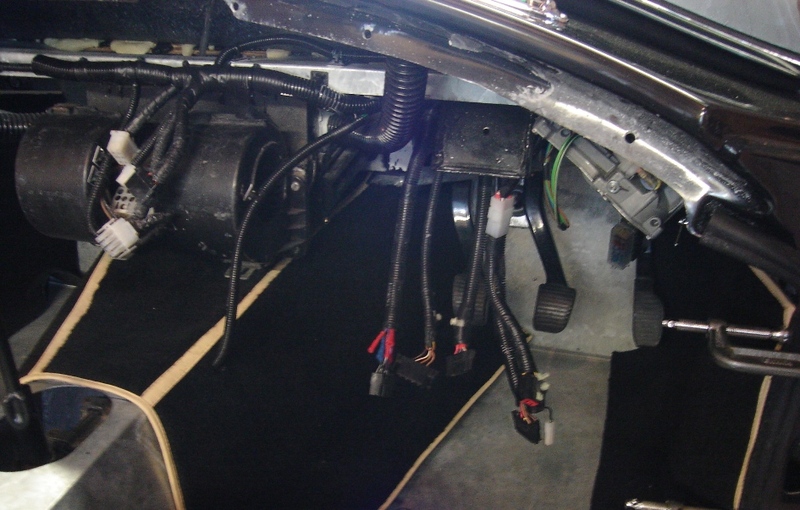 All wiring should be covered in convoluted tubing, spiral bind or special loom tape. Behind the dash is one area that can be hard to keep tidy and safe as its so conjested. If you secure the loom along the length of the scuttle and then tee off in the correct place you can end up with something fairly tidy. The picture below shows one way to do this. The many individual connectors were removed and replaced with a couple of multi-ways, this makes it all much tidier and also makes getting the dash in and out very easy. The dash simply plugs into the loom now, the back of the dash used with this car can be seen at the bottom of this page: Dash Electrics Again all wiring fully wrapped.